The title chosen for the film in Brazil could not be more precise ... Cloud Atlas is "the greatest trip"!! Based on the book by British author David Mitchell, published in 2004, great sales success and critical (won British Book Award for Literary Fiction, has been pre-selected for the Man Booker Prize, etc. ), the film version was not so well Successful as the book. 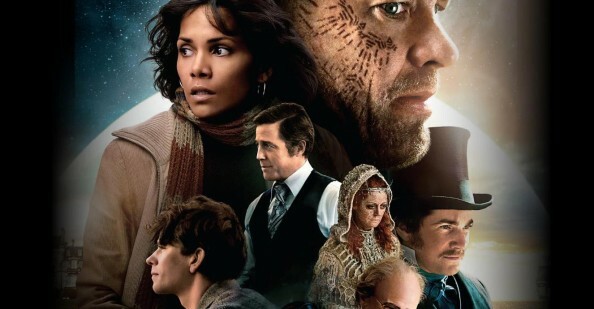 With a script extremely confusing, an assembly imprudent, a makeup not to believe the ugly to today's technology, the film gives time for what might have been and the good that has cast: Susan Saradon, Hugh Grant, Tom Hanks, etc. . If you got lost when watched Inception (2010), it took to find the script of The Matrix (1999) or Amnesia (2000), prepared for the trip. I will not even try to tell the story of the movie because I'm not able to repeat it in a consistent and intelligible. I acknowledge here my incompetence. All I can say is that the film tells six different stories that happen in times (ages) and different that connect to each other. (Really?) Or at least that's what they believe the reviews, articles and criticism about the movie. And also based on the book, of course. However, between the narrative form of the book and that brought to the screen, something happened. Something "out of the script." I spent most of the two hours of the film trying to understand the connections and trying to fit the pieces of this great "puzzle". And, worse, feeling the most ignorant of the ignorant for failing to understand this kaleidoscopic screenplay. But nothing is in vain, since the message of struggle for justice and freedom is eventually passed. Even if it is for a single person, which, in turn, will forward and resume a new cycle, a new era, also struggling to enforce this ideal. And amidst all this, there are still questions about reincarnation, religion, ethics, morality, etc.. But everything is tãooooo confused. You ought to be? To better understand the film, read the excellent article by Zeca Camargo, on the link below, which explains better the film. Maybe this is easier to understand TRIP! ~ By Lilia Lustosa on May 23, 2013. Karina, after you watch the movie we talk and discuss. Let's see if we understand the same things. I also quite liked Inception that despite confusing or complex, could have a meaning for me. Already this, I found a lot of "forçação bar", despite knowing, even before you start, that the stories were all linked ... I think the biggest problem was mounting. The choice of deconstruction is cool, but it has limits. Otherwise Dadaist is too too difficult to understand and too easy to be distracted or to fall asleep! Kisses and thanks for the comment.